Things happen for a reason. 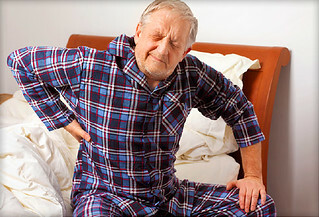 You don’t just catch back pain like you can catch a cold. It usually is related to something that you have done or are continuing to do poorly, like stand, sit, walk, breathe, bend or lift. An accident or acute injury can set pain into motion, but how you deal with the injury, pain and mobility after the fact is the important part. You are a product of everything you have done or been through up to this point and if that product has left you with chronic back pain then something has to change. You may need someone to loosen something for you, you may need to learn to move more efficiently, you may need to lose weight, or may even need surgery. Trust me when I say that 95% of the time back pain can be made significantly better if addressed properly. Back pain is very rarely just coming from one damaged structure that can be visualized on an X-Ray or MRI. You may find that you have a bulging disc in your low back, but if so, I would refer you to Step 1, “things happen for a reason.” Why do you have a bulging disc in your low back? Discs don’t just bulge for no reason. The way you are moving or sitting is likely causing too much stress on your disc, so the answer shouldn’t be “strengthen your core” or surgically fix the disc, it should be to learn what part of your body is making your disc work too hard and figure out how to change it. Everything is connected way more than you realize. Stiffness in your ankle from an old sprain may be causing you to compensate in your hip when you walk and be throwing your back out of alignment. The fall on your hip three months ago that only hurt for a few hours may have screwed up the mechanics of you hip and pelvis and now your back hurts. The fact that you always lean on your left side in an L-couch to watch TV may shift your ribcage and put uneven pressure on your low back. These are the types of things that are responsible for chronic low back pain; issues elsewhere in the body that have put the low back in a bad environment. An adept healthcare practitioner that can do a thorough physical assessment should be able to figure out the primary driver or root cause of your problem. I suggest finding a physiotherapist that will approach your care as a puzzle that needs solving and not just a symptom that needs treating. -If your shoulder isn’t working right, it is very easy to develop neck pain. This whole process can start at the top and work down, the middle and work out, or the bottom and work up. The key to treating your back pain is figuring out the pattern. Your low back is very likely the symptom and not the cause, regardless of what you see on an MRI. Unfortunately most people tend to focus on the above factors in reverse order. I have seen countless people with horrific looking X-rays and almost no pain. I have also seen people with perfect X-rays and MRI’s that continue to suffer. Diagnostic tests, for the most part, are just static snap shots in time of your back and don’t really tell you why backs hurt, only what is damaged. There are many systems in your body that make up who you are. Your skeleton forms your structural framework. Your muscles support and move your skeleton. Your organs keep all the systems alive and functioning. Your fascia helps hold everything together, and your nervous system provides the electrical wiring to connect all the systems together. These integrated systems create a person that is built to move and think freely, but any or all of them have the capacity to limit normal movement and create pain if something goes wrong. The mobility of your fascial system is strongly affected by surgeries and scar tissue. The flexibility of your muscular system is very contingent on the irritability of your nervous system (see Why Things Hurt). The irritability of your nervous system is equally affected by the health of your spine and cognitive factors like stress and anxiety. Our ability to over think things can leave us very out of touch with our bodies and in a lot of unnecessary pain (see Mindsight). Simple tasks like how you sit, stand, breathe and walk are hard wired into you from a young age, but have been affected by your injuries, jobs, sports and behaviours. The key to fixing your low back pain is to assess which of your systems is causing the most problems with your daily tasks and try to change it. I always tell my clients that I am going to guide them through the process of release, re-educate, rebuild. We are going to find the tight structures that are restricting mobility and alignment and we are going to try and release them (see below). Releasing these tight pulling structures will open up a window to allow the person to move differently; this is when the person needs to gain some awareness of how their body feels different and practice some movements to re-educate the body to better movement patterns. Once good movement patterns have been developed, it is time to build strength to reinforce them; this is how you create lasting change. Skipping the middle step and trying to build strength on dysfunction will bury the problem deeper and make it more resistant to change.